Sweet Treats - Saving the world from bad baking. 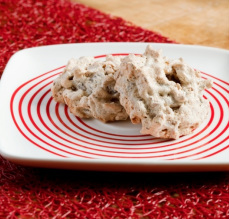 Sugarplum Bakery’s Beekeeper Biscuits are a delicous treat in a guilt free size. Beekeeper Biscuits are a macaroon style biscuit, light and crisp on the outside and filled with crunchy caramelised almonds and melting Lindt chocolate on the inside. Beekeeper Biscuits are baked after a traditional German family recipe from Cologne. They are Sugarplum Bakery’s most popular treat. Beekeeper Biscuit also make great gifts for friends, family, staff or clients. Packaging in see through bags allows attachment of greeting or business cards. Also available in heart shaped boxes as a special gift. Beekeeper Biscuits are also delicious as Wedding favours. Stop worrying about your chocolate melting the night before the big day, order Beekeeper Biscuits instead from Sugarplum Bakery and your guests will love it. Click here for more details, photos and prices. Beekeeper Biscuits are gluten free. Yummy little French cakes, irresistible! 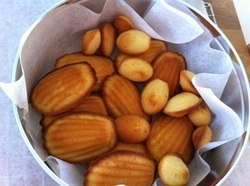 Madeleines are great as a sweet little morning or afternoon tea snack but also make great gifts for friends, family, staff or clients. Available in see-through bags to allow attachment of greeting or business cards. Contact Brigit for more information.